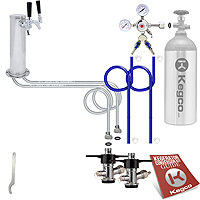 Successfully convert your compact refrigerator or chest freezer into a high performance two product draft beer dispenser using Kegco's Economy Double Faucet Tower Kegerator Conversion Kit, which includes all of the quality commercial grade parts you'll need to build your very own kegerator! With the same 3" diameter chrome plated metal draft tower found on many commercial grade kegerators and a pro series dual gauge regulator for safe and convenient CO2 management, this kit is loaded with exciting features that make it easier than ever to have a professional looking dispense system in your home bar or game room. The kit is designed to dispense two separate kegs of your favorite beer, and can run 2 full size kegs, 2 pony kegs, 2 six gallon kegs, or any combination you choose depending on your refrigerator's capacity. Comments: This is exactly what my husband wanted. It is great quality and comes with all the parts we needed to convert the kegerator from a single to double tower! Comments: This stuff is snazzy and high quality. My kegerator tower looks way nicer than the mini fridge I mounted it to hahaha.